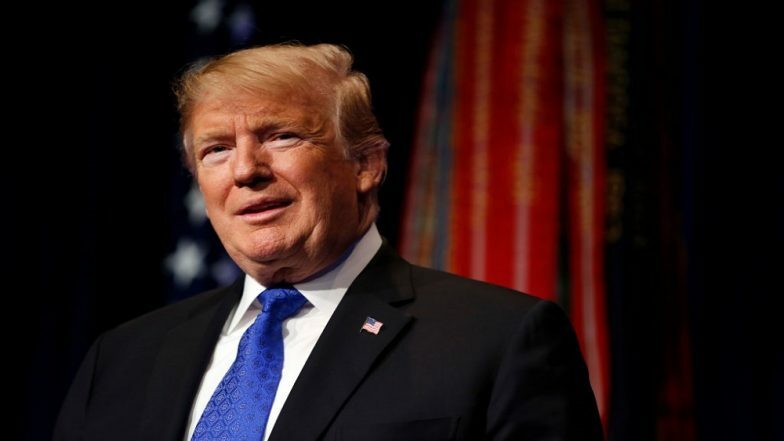 Washington, March 30: US President Donald Trump has threatened to close the country's border with Mexico to trade for a "long time" and insisted that America has run out of detention space for undocumented immigrants. "If Mexico doesn't immediately stop all illegal immigration coming into the US through our Southern Border, I will be closing the border, or large sections of the border, next week," he said in a tweet on Friday. Speaking to the media later on Friday in Florida, Trump said: "We have the weakest, most pathetic laws... We have run out of space. We can't hold people anywhere. Mexico can stop it so easily," CNN reported. Donald Trump Declares National Emergency to Build Wall Along US-Mexico Border With Federal Money. Trump's remark comes as the Department of Homeland Security and border officials have said that their resources have become strained. Earlier this week, Customs and Border Protection (CBP) Commissioner Kevin McAleenan said the "breaking point has arrived" for the US immigration system. Over the last two weeks, the CBP announced that they will be releasing migrants in Arizona, as well as the Del Rio sector and Rio Grande Valley region of Texas. More people are expected to be apprehended at the border by the end of March than any month since 2008, the agency said. The Justice Department has not commented on the legality of closing the border or any portion of it, as described in the President's tweet. Though border closures are rare, they're not unprecedented, CNN reported. In 1985, the abduction of a Drug Enforcement Administration agent and subsequent threats against customs agents prompted then-President Ronald Reagan, in agreement with the Mexican government, to close nine border crossings on the southern border.